Fireside Lodge has a collection of real barnwood bar room furniture and accessories. The barnwood is rescued from out of business tobacco farms and repurposed to make beautiful classic furniture that is American born and raised. The Barnwood Floor Pool Cue Rack matches perfectly with the Barnwood Pool Table, but also suits the aesthethic of many mature game rooms, bar rooms and billiards spaces. The barnwood is finished with a clear finish to strengthen it, but not destroy the natural beauty of the wood. The pool cue rack fits many pool cues and accessories and stands on its own, so it doesn’t take up wall space to display your pool table accessories. If you have a pool table, then a pool cue rack is a must-have. What kind of pool rack are you looking for? 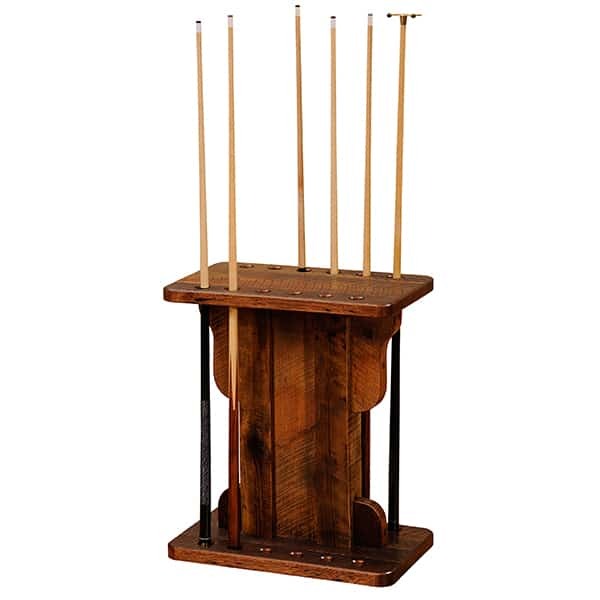 Are you looking for a cue stand with style, or one that gets the job done? Find one with both at Family Leisure.